I bought some time ago a couple of motors from Dongbu: the Herkulex DRS-0101. These motors are ‘smart’ because they have inside a microprocessor that allow to manage many parameters and the behavior of the motors. The Herkulex are an alternative to more famous motors like the Dynamixel. 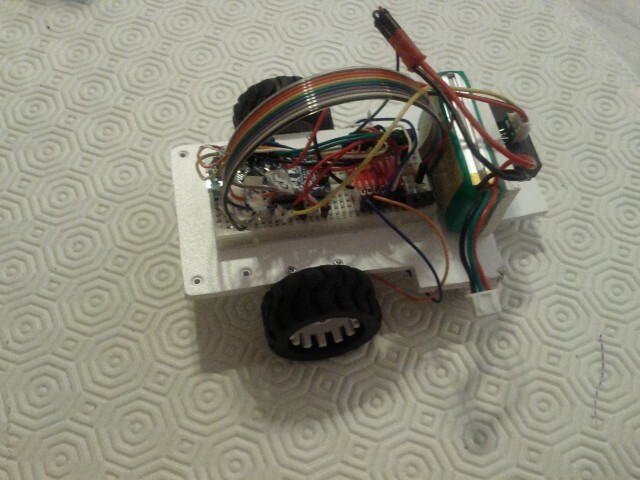 They have 4 wires and can be drove by a simple microprocessor with a UART (serial) port. My choice is to control them with an Arduino, so I wrote a simple library supporting all the most common Herkulex functionalities. For the wiring of Herkulex to Arduino, it is important to consider that it is necessary to dedicate a serial port to the communication Arduino-Herkulex.It is not possible (or is not advisable) to use the standard Arduino port because it is dedicated to communication between PC and Arduino to see the values in the serial monitor. So it is important to use another serial port. For the Arduino Mega it is easy, because the Mega has 4 serial ports, for the Arduino Uno/2009 that has only one serial port, it is mandatory to use a software serial port. So a library called SoftwareSerial has to be included if we want to use the Arduino Uno/2009. To do this the last version of SoftwareSerial is not useful, so I included in the library also the right SoftwareSerial version in order to work well with Arduino Uno/2009. I think the Herkulex are a good motors. My tests are not very deep and I don’t stressed the motors, but in general, compared to Dynamixel, I think they are good. The big difference is the possibility to set a large variety of parameters and the possibility to start and stop the movement for all the motors at the same time leaving to motors the definition of acceleration and speed needed to cover the distance assigned in the same time frame. Some time I experimented problems with the Serial port, receiving the data, I tried to limit them in the library, but sometimes these problems are present yet. This depends by the Herkulex motors, not by my library. These are the details of each command. rx, tx: receive and transmit pins. 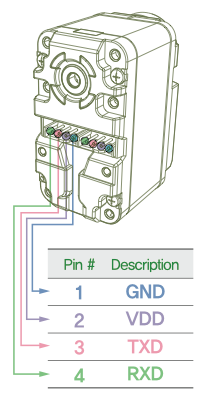 The receiving pin on Arduino has to be wired with the transmission pin on the Herkulex. The same for the receiving pin. Although it is one of the classics of robotics for beginners, the line follower robot, made ​​at high level, is quite complex. On Youtube you can see line follower running at 3 m / s and more, with optimization and maximum performance research that achieves discrete levels. Usually a line follower competition is based on pure speed and the path is quite linear and simple, with large curves and wide straights. In this case the hardware part is the most important, because the sw part is quite simple to build. it is important to find the right compromise between the mechanical parts and the engine, to make it running as fast as possible. Unfortunately requires a lot of money, because the engine performance search or the wheels with special tires can be very expensive.The alternative is based on paths that are rather difficult or very twisted, with right angles, intersecting lines, lines breaks, obstacles and so on. In this case the HW is much less important. More important is the algorithm and then the sw. The ability of the robot builder is to build a powerful algorithm that allows the robot to drive fast in every situation. In this tutorial I would describe the robot that I have realized, that is able to face a tortuous path made ​​of curves at 180 ° rather than tight coils, trying to have a good speed. The robot ,according to tradition, was home built. It is also already equipped with an infrared sensor front in case you wish to use it in a path with obstacles. 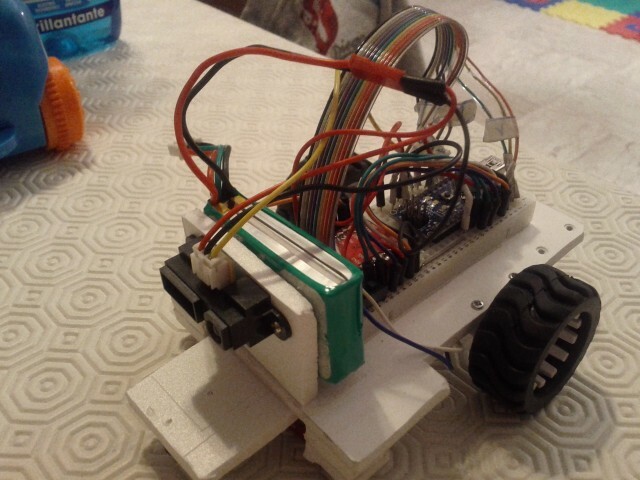 As you can see the components expensive are Arduino Nano and the motors. Nothing forbids to use a traditional Arduino with an obvious saving of money. In my configuration it weighs about 160 grams. You can do much better, in fact on the internet there are line follower with Arduino that weigh 100 grams. Some comments on hw components used. The driving system, formed by Pololu wheels and motors is almost good. I think that even better is using HP 100:1 Pololu motors which provide even more traction and fluidity in the changes of direction, even if it has a lower number of revolutions/minute. I tested also the 30:1 motors, but they were too nervous. Absolutely bad is the plastic wheel caster form Pololu. Unfortunately I had no other small than this, so I kept it. Not recommend its use. Terrible. The motor driver SparkFun TB6612FNG is a little undersized. In fact it provides 1.2A at full speed, when the Pololu HP motors may require up to 1.6A. But I had no problem with these drivers and they still work, so I can only advise them. 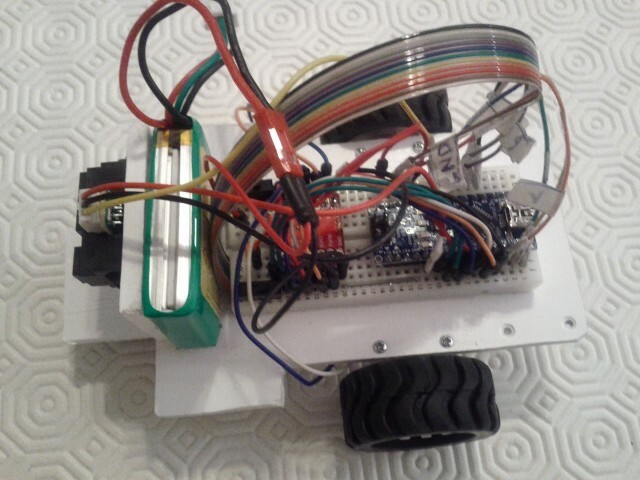 Unfortunately they have a lot of wires, 7 for driving, 2 for the Vcc voltage (+5 V), one (or two with the ground) for the motor voltage and 4 wires for motors. In total 14 wires that are several. They are simple to program and manage. The full brake function is not good. In fact, if you need to brake, however, takes a little bit to stop, victim of inertia. I think that the engines 100:1 can help on this. The line sensor Pololu QT-8RC is good. It provides out-of-the-box a digital output and can be connected directly to the Arduino digital ports. After a stage of self-learning during the first few seconds (see the video), it is able to calibrate with the best values ​​taking into account the reflectivity of the surface and the ambient light conditions. It can follow the black lines on white background or white on black background. 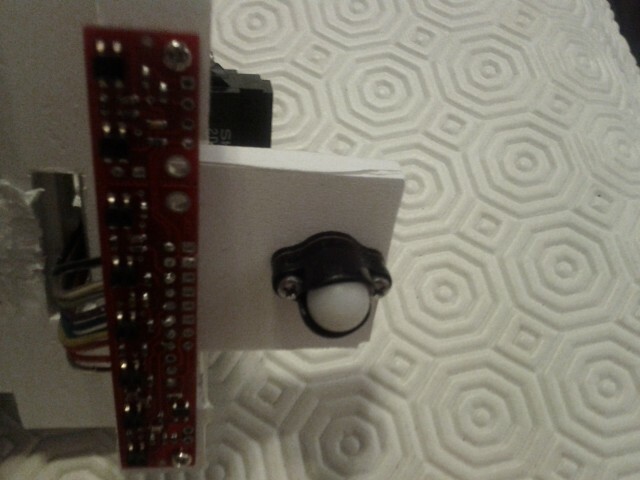 For this sensor there is an Arduino library written by Pololu that provides a value between 0 and 8000 depending on the sensor (from left to right) which is above the black line. I modified the library to get a response that goes from -800 to +800 with zero when the line is well below the IR sensor in the middle. This from my point of view makes easier the control. The only real problem I had was in the presence of right angles. In this case the robot has not always stopped in time and managed to turn. Unfortunately I have no videos on this particular problem. Once built the robot, the biggest difficulty is the control parameters determination, that allow the robot to come back to the line when goes away. In this case I have put in place the usual PID control, although in my version was reduced only in PD, proportional and derivative. The integral control, with the frequent changes of direction, is extremely difficult to detect. I also wrote some simple routines for the detection of right angles. In this case the robot tries to stop and turns 90°. This technique has worked quite, but you can sure do better. The dc-dc converter costs less than 10 euros, while the cost for the Pololu encoder is about 25 euros. Maybe in the next version of the Microbo(t) I will decide which solution to adopt. Clearly the solution encoder is more sophisticated but requires more programming effort (and verify that there are still pins available on the Arduino!). The great idea to anchor the robot upside down so that it has the motors connected to the base. This is very important because while the robot works, the motors remain attached at the base, allowing the robot to have arms very light. Lightness means low friction, low inertia, low power motors, precision, speed, fast acceleration and deceleration. These aren’t laboratory prototypes, but commercial robots and they cost about 50-60.000 euros. 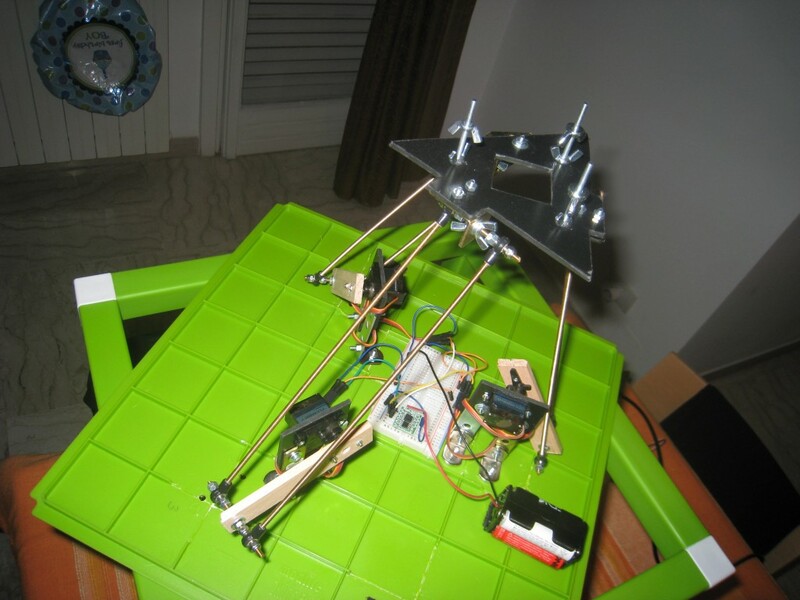 I tried to build a simple delta robot with Arduino. 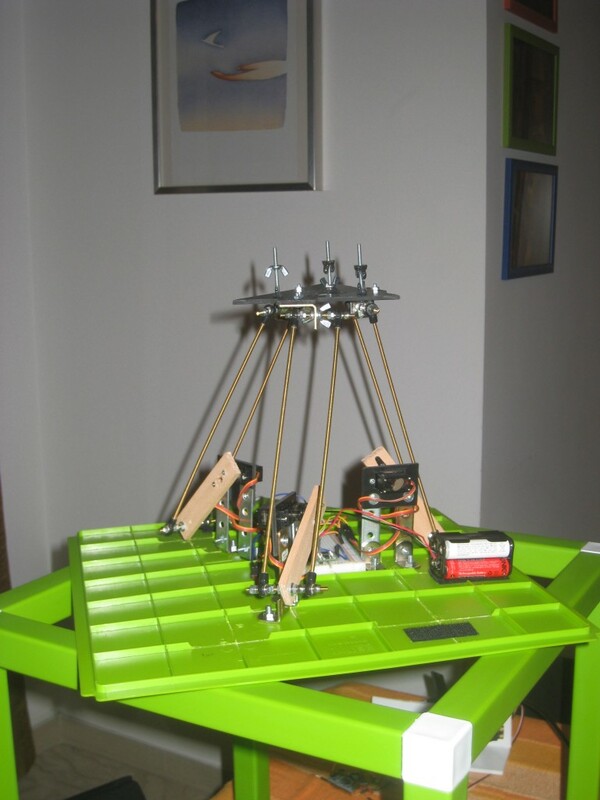 My Delta robot works like the commercial Delta robot, ie, in inverse kinematics. Given a point x, y, z in space, in real time Arduino calculates the angles of the servomotors that allow to reach that point in space. The Delta robot has two triangular plates. A higher which is fixed and the lower is free. 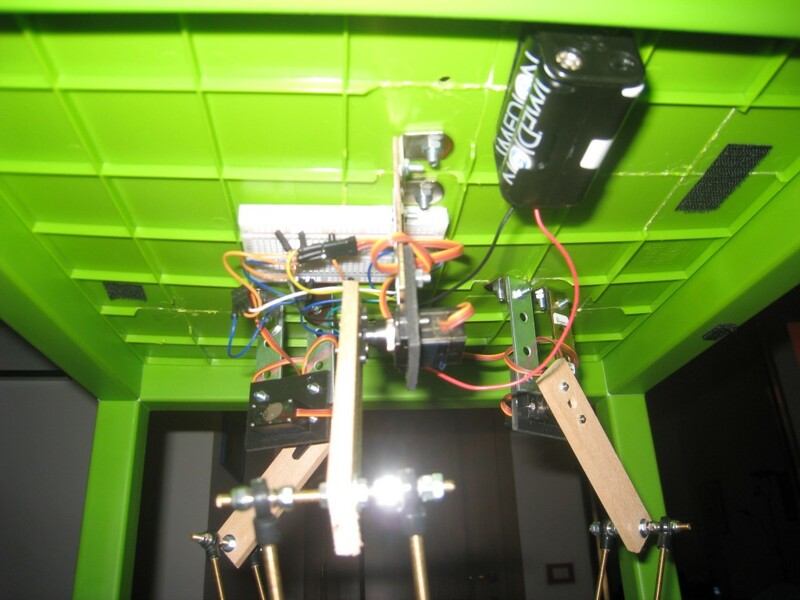 The servo motors are fixed to the top plate. The gripping tool (i.e. an electromagnet, a gripper, a vacuum suction cup), is fixed to the lower plate. The two plates are triangular equilateral, that is, equal sides and equal angles of 60 °. The Delta has 3 servo motors and two arms for each servo. One is integral with the servo. The other arm is free to rotate in all directions and it is connected to the lower small triangle. In order to ensure the free turning, the second arm is linked with ball joints. To find the ball joints has not been easy. I found something about the steering of the machine model. Just search on google “joint Uniball” and you can find little cheap joints. 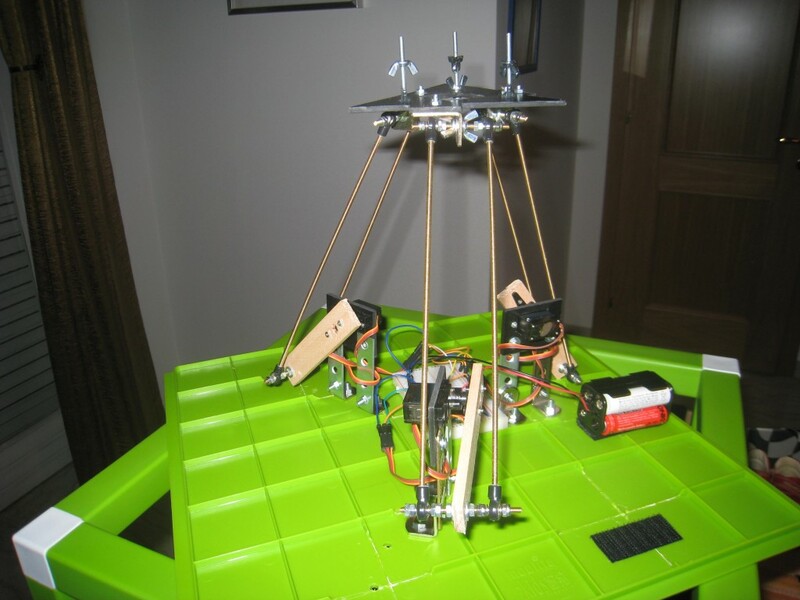 A very good explanation about the the Delta robot geometry and a very effective explanation of inverse and direct kinematics formulas can be found here . You can find also the code that calculates the inverse kinematic. 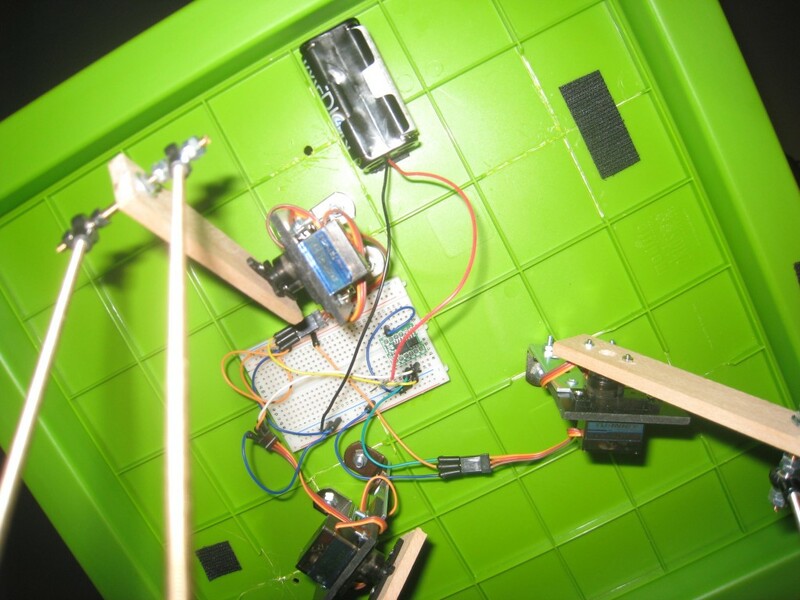 These are some Delta robot pictures (with an ATtiny85 microcontroller). The end effector can be used with different tools. I tried a vacuum syringe and a drawing pen. These below are some videos with different tools. The first experiment with a simple trajectory (a circle). The Delta robot drove by a mouse with Processing. The code is available here. The Delta robot in pick and place configuration. The code is available here. The Delta robot drawing. This is a first draft. The code is available here.